Following an 11-week high, gold fell after the Federal Open Market Committee released its March meeting minutes, sending the US dollar upwards. Gold fell from an 11-week high on Thursday (April 11) following the release of minutes from the March Federal Open Market Committee (FOMC) meeting. The yellow metal lost the gains it made prior to the release, as the US dollar shot up. Spot gold was down 0.2 percent at US$1,350.70 an ounce, and US gold futures fell 0.4 percent to US$1,354.5 an ounce. These comments left investors seeing the minutes as hawkish, and that forced the price of gold down. Andrew Grantham, senior economist at CIBC World Markets, said those stats could help boost the US dollar, which in turn would be negative for gold. That’s because a stronger greenback makes commodities priced in dollars more expensive for investors using other currencies. “The apparent greater confidence regarding the inflation and growth outlook should be modestly positive for the US dollar,” he said. However, rising tensions over military escalation in Syria prevented further losses for the precious metal. On Wednesday (April 11), US President Donald Trump warned Russia of imminent military action in Syria over a suspected gas attack. Trump declared that missiles “will be coming,” and attacked Moscow for standing by Syrian President Bashar al-Assad. 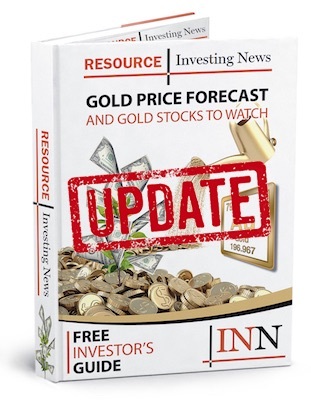 Given the current political climate, Innes believes that gold at above US$1,400 could “be [in] the cards immediately.” As of 10:10 a.m. EST on Thursday, gold was down 0.95 percent, trading at US$1,339.40.